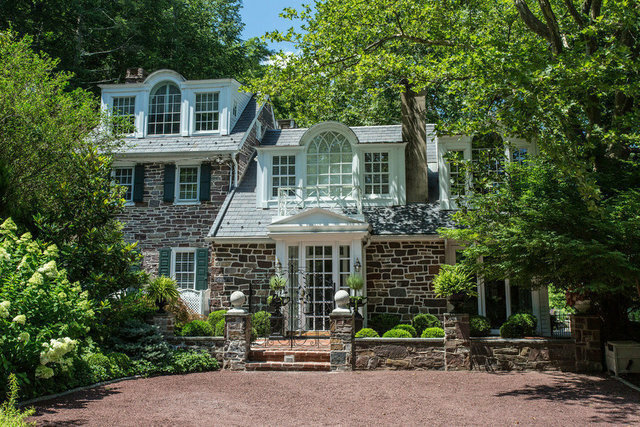 This is the quintessential Bucks County stone home combining old-world charm with sweeping Delaware River views from every room. The home has been expertly renovated and expanded over its long history to offer light-filled, genteel interiors. Architectural millwork and exposed stone walls with large fireplaces and beamed ceilings create great richness that complements any style of decor. Two graciously scaled living rooms provide a flexible layout. The kitchen is a sun-filled, inviting space, well designed with a vaulted ceiling and skylights, natural-finish wood cabinetry, granite countertops, professional-grade appliances and a large butler's pantry. A cozy formal dining room nicknamed "The Tavern Room" has exposed stone walls. A lovely sitting room with corner fireplace completes the main floor. The rich visuals continue in the main bedroom suite with a vaulted ceiling, Palladian window and French doors to a Juliette balcony. The master bathroom is crisp white and enjoys panoramic river views. There are two additional bedrooms and two lovely baths and a helpful laundry room. Outside, the terraces offer enchanting water views and elegant simple landscaping and hardscaping.